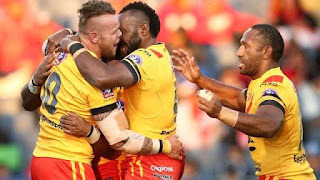 SYDNEY, Australia — Winger Junior Rau scored two tries to lead Papua New Guinea to a 26-14 win over Fiji in a rugby league international on Saturday. Despite giving up more than 500 games of National Rugby League experience to their rivals, Papua New Guinea led 26-4 at halftime and held on for the win. With just six NRL players to Fiji’s 10, the Kumuls ran in four tries, with fullback Justin Olam scoring one and setting up another to complement Rau’s performance. Samoa played Tonga in the second match later Saturday at the same Campbelltown Stadium in western Sydney. Before the match, Andrew Fifita said he would play for Tonga for the rest of his career, foregoing tens of thousands of dollars if he had decided to play for Australia. Fifita was born in Sydney but has Tongan heritage.